In November 2005 Miquel Artigas (Sabadell, Spain) kindly presented in Chess Notes (C.N.s 4008 and 4015) six photographs discovered in the archives of the Club d’escacs Sabadell. All were taken in August 1945, during a small tournament in Sabadell won by Alexander Alekhine and, unexpectedly, two of the pictures have given rise to curious mysteries. General view of the playing area, with Alekhine on the far right. 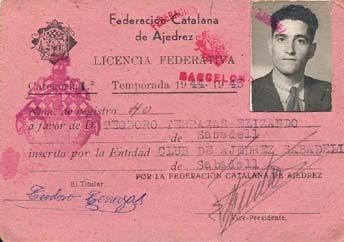 The six photographs from Sabadell, 1945 were provided by Mr Artigas with the permission of the President of the Club d’escacs Sabadell, Oscar Oliva. 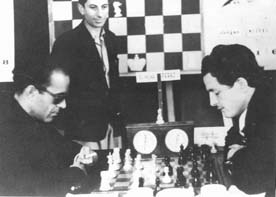 The question, therefore, is whether Morán’s book, which gave no source for the score of the Alekhine v Muñoz game, was mistaken. 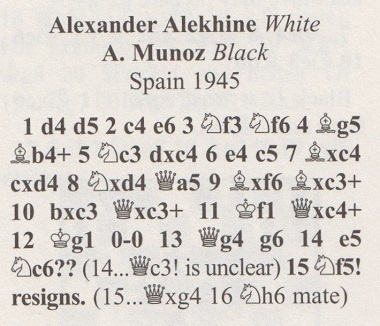 The same 15-move game was also given as Alekhine v Muñoz on page 728 of Alexander Alekhine’s Chess Games, 1902-1946 by L.M. Skinner and R.G.P. Verhoeven (Jefferson, 1998), but the source specified there was merely Morán’s book. 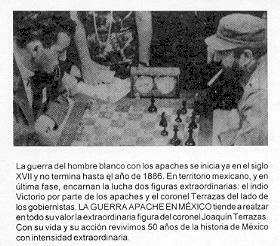 On the other hand, if Morán was correct that the 15-move game occurred between Alekhine and Muñoz, how could the above photograph be explained? Round one (2 August): Alekhine v Vallés. ½-½. Round two (3 August): Mena v Alekhine. 0-1. Game unavailable. 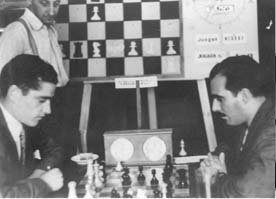 Round three (4 August): Alekhine v Vilardebó. ½-½. Game unavailable. Round four (5 August): Terrazas v Alekhine. 0-1. Round five (6 August): Alekhine v Ros. 1-0. Game unavailable. Round six (7 August): Medina v Alekhine. ½-½. Round seven (8 August): Alekhine v Pérez. 1-0. Game unavailable. Round eight (9 August): Lupi v Alekhine 0-1. Round nine (10 August): Alekhine v Muñoz 1-0. 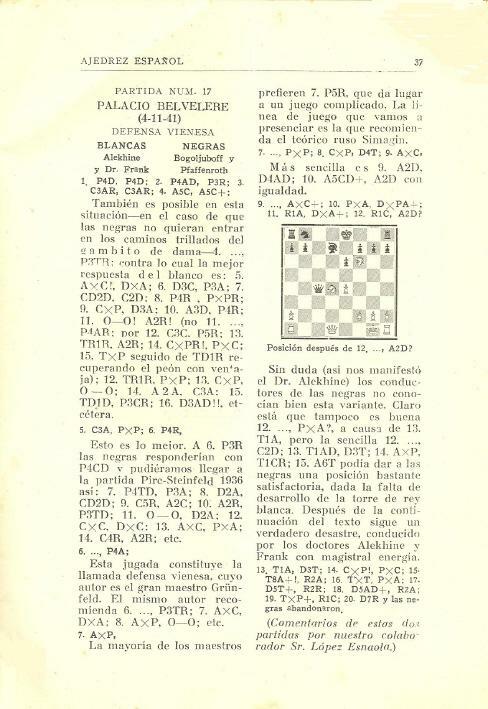 See, furthermore, pages 225-235 of A. Alekhine Agony of a Chess Genius and pages 291-304 of the original Spanish edition of Morán’s book, Agonía de un Genio (Madrid, 1972). The round-by-round pairings given in Skinner and Verhoeven’s book are consistent with the order of the draw shown in the crosstable, i.e. 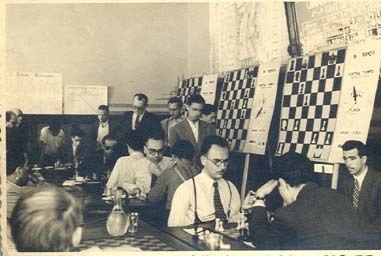 1 Ros, 2 Medina, 3 Pérez, 4 Lupi, 5 Alekhine, 6 Vallés, 7 Mena, 8 Vilardebó, 9 Terrazas and 10 Muñoz. Assuming normal pairings, this means that the final round was Terrazas v Ros, Alekhine v Muñoz, Vilardebó v Medina, Mena v Pérez and Vallés v Lupi, and that is what is pictorially shown, except that Vilardebó and Medina are only in the group picture – which also has “9 ronda” on the demonstration boards. The larger group shot (below) also shows a couple of tournament charts above the demonstration boards. The right-hand one seems to be some local subsidiary event, but the left-hand one is complete, with 11 cards, the top one a heading and No. 10 partly obscured by the demonstration board. The names are illegible, but it can be judged whether it is a long or short word, and this too is consistent. It is therefore absolutely sure that the Alekhine v Muñoz photograph of the French Defence game is from round nine, after about one hour’s play, as shown by the clocks, and that the 15-move game cannot have been played between those two players in the Sabadell tournament. In any case, apart from his score of only 2/9 in that event Muñoz seems unknown to chess history, and too weak to have played such a sharp variation. 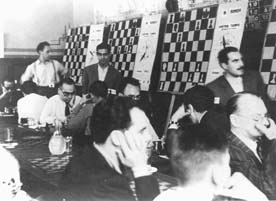 Alekhine drew with Vilardebó so, on the face of it, the 15-mover would have to be either Alekhine v Pérez or Alekhine v Ros, which are the two missing games which he won as White. The only other known game by Alekhine in his entire career which opens 1 d4 d5 2 c4 e6 3 Nf3 Nf6 4 Bg5 Bb4+ (most other opponents played 4...Nbd7) appears to be the consultation game Alekhine and Frank v Bogoljubow and Pfaffenroth, Warsaw, 1941. It varied from the 15-mover with 12...Bd7? 13 Rc1 Qa6 14 Nxe6 fxe6 15 Rc8+ Kf7 16 Rxh8 gxf6 17 Qh5+ Ke7 18 Qc5+ Kf7 19 Rf8+ Kg7 20 Qe7 Resigns. See pages 670-671 of Skinner and Verhoeven’s book. 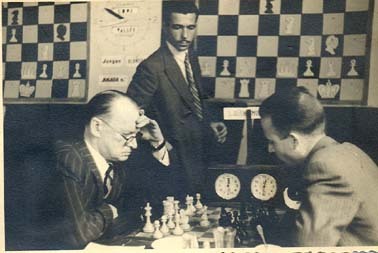 The game was also given by Morán in his notes to the 15-mover which he incorrectly headed Alekhine v Muñoz. In his annotations to the consultation game on page 185 of the 1 December 1941 issue of Deutsche Schachblätter Alekhine commented that “after 12...O-O White would obtain a winning position by means of 13 Qg4 g6 14 e5! (threatening Nf5)”. In other words, the 15-mover had essentially appeared four years earlier. During his last five years Alekhine normally played 1 e4, mainly reserving 1 d4 for selected stronger opponents. Then after 1...Nf6 2 c4 e6 3 Nf3 Nf6 or b6 he would go into a Catalan or Queen’s Indian. 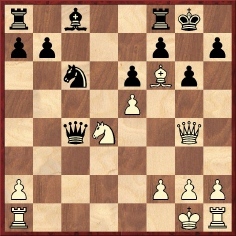 So would a lesser player like Pérez or Ros choose, as Black, an obscure system with such a dubious reputation four years later in Sabadell, and why should Alekhine choose 4 Bg5 rather than his usual 4 g3 against a random opponent when he was not to know that the game would go down the Vienna Variation route? 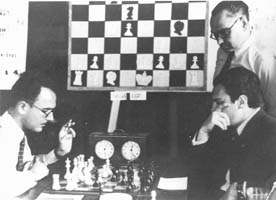 I met Francisco Pérez (who died in 1999) at the 1958 and 1960 Olympiads, at which time he was a strong and ambitious International Master. 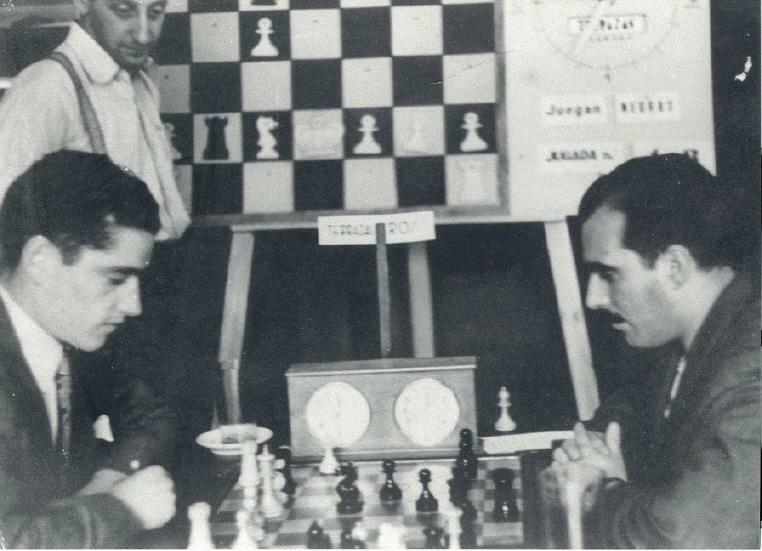 Later he emigrated from Spain to Cuba, where he could play on a high board, become the national trainer and compete in the Capablanca Memorial tournaments in Havana. He was theoretically up-to-date in the King’s Indian, which he used in 1958, and I find it hard to believe that he would have tried to surprise Alekhine with a rare dubious line and then fallen into a one-move trap. In the meeting between Alekhine and Ros one would expect 1 e4 by Alekhine (against a weak opponent) or, if 1 d4, a Catalan. And if Ros really knew enough to choose the sharp Vienna Variation he might be expected to know the above-mentioned consultation game. In the 15-mover Black’s play is both too strong (knowledge of a sharp theoretical line) and too weak (the worst possible move was played at the first opportunity). 14...Nc6 (the only independent move in the 15-mover) is really bad, as it allows not only 15 Nf5 but also 15 Nxc6, after which 15...Qxg4 permits 16 Ne7 mate and if 15...Qxc6 then 16 Qf4, followed by Qh6-g7. 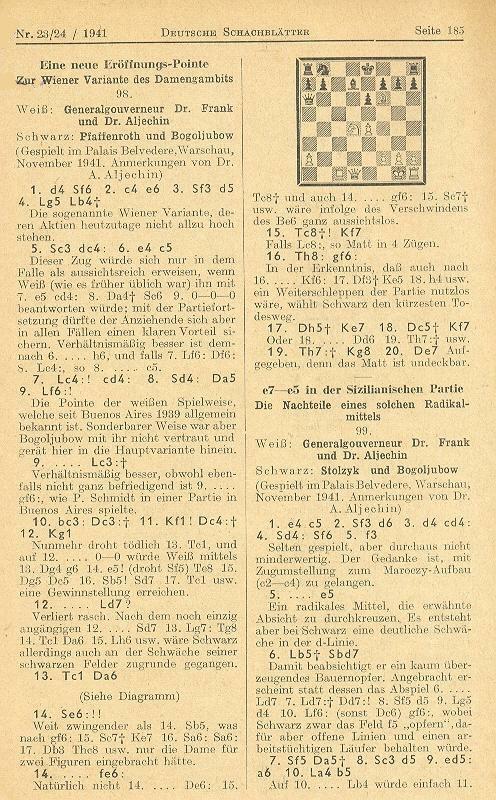 It is also worth mentioning that the consultation game was given on pages 230-231 of Schachgenie Aljechin by H. Müller and A. Pawelczak (Berlin-Frohnau, 1953), with a note at move 12 which included the line 12...O-O 13 Qg4 g6 14 e5 Nd7 15 Qf4 Nxf6. However, 14...Nd7 is answered by 15 Nf5. The German book was obviously unaware of Alekhine’s annotations in Deutsche Schachblätter, which is surprising as Müller was a well-known theoretician. However, the book’s other suggested reply to 14 e5 is 14...Re8, which creates a hole for the black king at f8 and therefore stops the 15 Nf5 trick. Nobody has yet been able to identify Alekhine’s opponent in the 15-move game. ‘I have been doing some research in the Arxiu històric de Sabadell, where the local newspaper Sabadell of the time is available. Unfortunately there are only two pieces of information about the tournament preliminaries and no further news about the event, crosstable or scores. 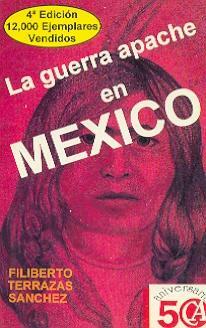 As mentioned on pages 8-9, in 1962 Terrazas wrote El águila caída, a biographical novel concerning Carlos Torre. 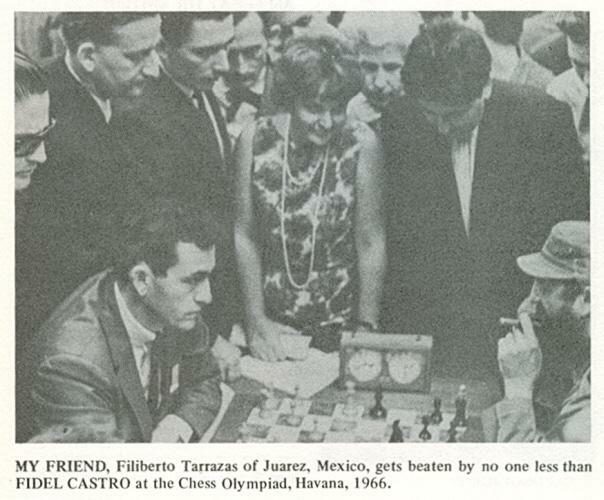 Above is a photograph of Filiberto Terrazas from page 143 of With the Chess Masters by G. Koltanowski (San Francisco, 1972). In C.N. 6034 we mentioned that the apparent resemblance between Filiberto and Teodoro Terrazas left us more puzzled than ever. And there the matter currently stands. 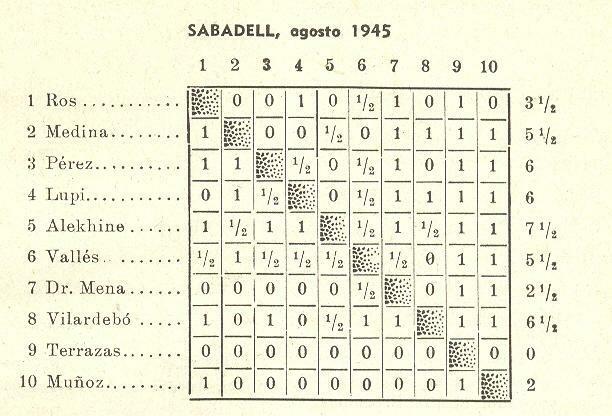 At Sabadell, 1945 did Alekhine face the adult local player Teodoro Terrazas Elizando or the 11-year-old Filiberto Terrazas? Latest update: 27 August 2017.